Create single- and multi-panel 2D cross sections of interpolated (modeled) geologic data: lithology, stratigraphy, geochemical/geophysical data, fractures, aquifers, colors, and vectors. Include logs, borders, titles, legends, location maps. These features are included in RockWorks Standard and Advanced Levels. Create section location maps as separate images and/or included in the section itself. 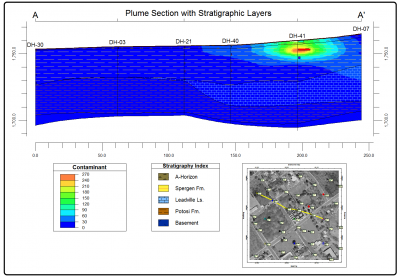 Profile diagrams can display orientation “stripmaps” and borehole collar distances to the projected profile line. Interpolate a solid model of lithology materials, create 2D profiles, sections, and projected sections with colors and/or lithologic patterns. 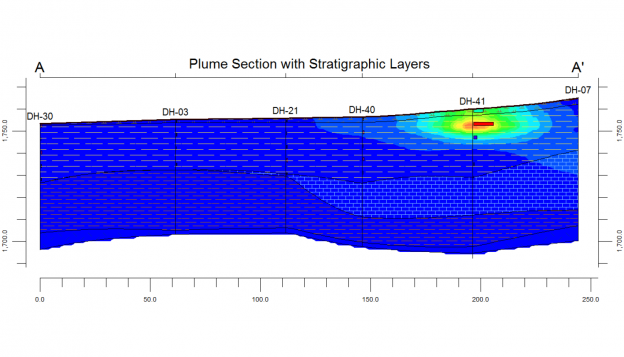 Interpolate a surface-based model of stratigraphy layers, create 2D profiles, sections, and projected sections with formation colors and/or pattern designs. Interpolate a solid model of “I-data” or time-based “T-Data” measurements, create 2D profile, section, and projected section diagrams with line and/or color-filled contours. Interpolate a solid model of “P-data” measurements, create 2D profile, section, or projected section diagrams with line and/or color-filled contours. Interpolate a solid model of soil colors, create 2D profiles, sections, and projected sections with soil color fills. Display proximity to fractures as single- and multi-panel cross sections. Include line and/or color-filled contours on the panels. Aquifer top and base surfaces can be displayed in profile, section, and projected section diagrams, with color and/or pattern fills. This entry was posted on June 20, 2017 by Rockware Test Admin.